The Federal Court of Australia has ordered Euro Solar (trading as P&N Pty Ltd and P&N NSW Pty Ltd), sister company Worldwide Energy & Manufacturing (WEMA) and their director Nikunjkumar Patel to pay fines totalling $145,000 for making false and misleading representations, according to a press release issued by the Australian Competition & Consumer Commission (ACCC). Euro Solar has never been an installer in the Solar Choice network. 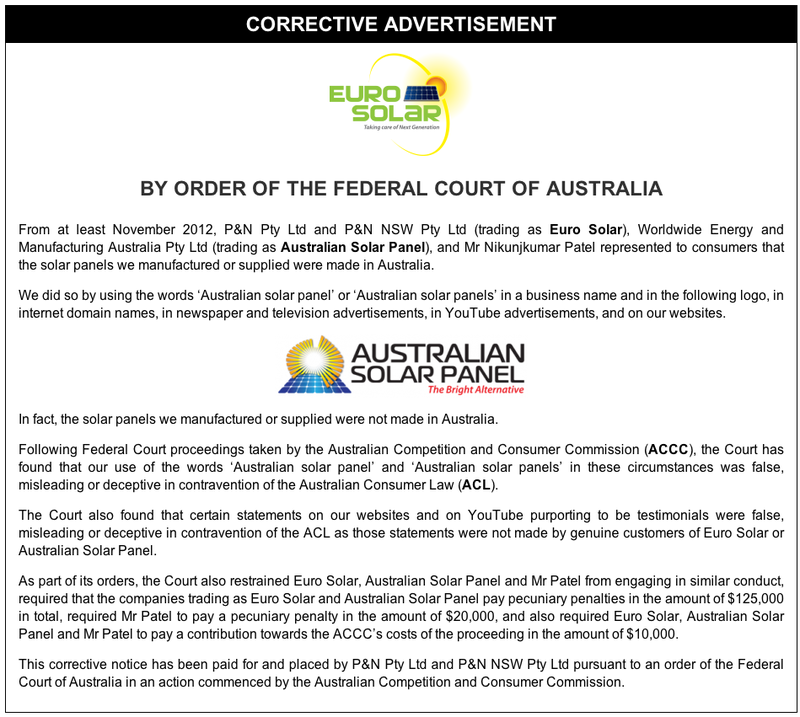 In February 2013, Solar Choice wrote to consumer advocate organisation Choice advising them of Euro Solar’s conduct, and the potential damage that was being occasioned to the industry by their conduct. The reasons the ACCC cited for the fines were the company’s ‘publishing fake testimonials’ and ‘making false or misleading representations about the country of origin of the solar panels they supply’. WEMA’s panels were previously sold under the brand name ‘Australian Solar Panels’ in spite of the fact that their country of origin is China. The ACCC also determined that video testimonials about the company posted on YouTube were ‘not made by genuine customers of the company’. The same was found to be true about written testimonials on WEMA’s website. The fine for fabricating testimonials is the first of its kind in Australia. Justice Besanko found that the companies and Mr Patel engaged in careless and reckless conduct and knew that the representations made were both false and misleading. His Honour also found that it was “suggested in some of the advertisements that not only were the solar panels made in Australia but that customers or potential customers ought to be supporting them because of that fact” and that these representations “were a central part of the respondents’ business and marketing strategy”. The companies have also been ordered to post a ‘corrective advertisement’ (below) about their misconduct. Company now in Liquidation as of today. It’s true, Bev – as per ASIC insolvency notice here. I have paid a deposit of $850.00 for a 10kw system and am worried about the whole thing now and thinking I should cancel. They will keep $220.00 but may be cheap lesson for me? What do you think? euro solar winding up and got notice from ATO? They are still sending me emails detailing their latest special offers !! I have requested to be removed from their emailing list, let’s see what happens !! I’ve been getting junk emails from these guys ever since I made the mistake of contacting them for a quote in Feb 2016. I ask to be unsubscribed. I’ve even written it in CAPITAL LETTERS so they get the message but they keep sending me garbage emails. Can someone tell me how to report them. hi , I am not surprise of the dishonesty regarding this company , I was nearly caught in sighing until I did some research and found that one of their rep *name removed by moderator* or [*name removed by moderator*] in Eastern Melbourne has had his surname and location changed on many occasions as found on his LinkedIn Website and as I believe honest persons do not require change of names . solar installed 03/09/213 inverter failed 2017 after many weeks of emails and phone calls to *name removed by moderator* told they will replace. But new 1 has to come from overseas and will take 4 more weeks still waiting now 8weeks .Losing money. Why no parts here? And when we do get inverter have to give Euro QLD a ring so that they can get technician out . Have sent photo’s to them and they reply “there’s nothing wrong with the installation” !!!! !